One of my units began to report Fahrenheit occasionally. Turned out GP3 was floating. Added a strap to the C pin on the PCB and all is good now. Amazingly, this also showed the C and F labels on the schematic were swapped, along with the description of GP3 in the text below from 2001. There have been a couple of reports of missing digits in the data stream from the microcontroller to the host. I have a theory. The PIC 12C509 is meant to be programmed in a specific way by the seller. The code space contains a preprogrammed calibration constant for the internal R/C oscillator. The instructions that I provided to the original seller Kitsrus specifically excluded the memory address for the calibration constant, so that the constant set in chip manufacturing process would be left intact. However, if someone has later attempted to duplicate the code from one PIC 12C509 to another, this might result in an incorrect calibration constant for the oscillator. It is impractical to correct, since the PIC 12C509 with plastic top is a one-time-programmed part. As a result, the asynchronous serial data would not exactly match the baud rate expected by the serial port. Characters would be dropped. If you were to analyse the electrical signal on the serial port, and compare the timing against the baud rate, you may find that is the cause of the problem. Of course, the timing source in your serial port, or USB to serial converter might also be a source of the symptom! That said, I've not tested that it works on chip! George asked I already own a temperature kit (it works perfect in my serial port) and I would like to know if it is compatible with USB to Serial adapters? Perhaps. The original design was not compatible with all serial ports, and so it is entirely possible that it might not be compatible with some USB to serial adapters. If you're able to see into the adaptor and detect a small integrated circuit of about 16 pins that is labelled MAX232 with about four capacitors around it, then it is likely to work. The MAX232 or equivalent raise the operating voltage to meet the standard. If you are able to test the adapter first by measuring the voltage of a signal line like DTR with respect to the GND pin, (this will be non-zero just by plugging it in to a USB port, no application should need to be run), ... if you get around 5V, then it probably won't power the temperature kit well ... but if you get around 12V it should work fine. 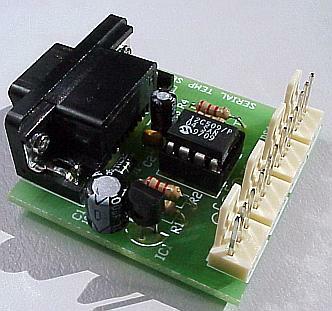 You can also modify the temperature sensor kit for an external 12V DC supply, by disconnecting the DTR trace from the connector to the diode, and connecting 12V DC there. Instead of powering the microcontroller and sensors from the DTR signal, it will be powered from your external source. You can also modify the temperature sensor kit to use the USB supply voltage, by connecting the 5V line from the USB cable (the computer side of the USB to serial adaptor) to the 5V *output* of the voltage regulator. As the copyright owner of ds1820.asm below, which is licensed under the GNU General Public License, I would like to hear from anyone who has purchased a microcontroller which contains a work derived from this, and who has not been able to obtain the source code of the version on the chip. on what basis you believe it is derived from my work. In addition, if you have obtained the source code, and it is clearly derived from my work, I'd like to receive a copy of it so that I can improve the project. Please let me know how I can receive a copy. Want to contribute to tsl, or run it on Debian? http://quozl.linux.org.au/packages/ contains packages for Debian GNU/Linux. Quozl continues to get mail about this project. This is quite encouraging! But he lost the mailing list and doesn't plan to recover it.If you are wanting help, or are willing to help others, please visit the project community page. Just a handful of components builds an 8-pin microcontroller based circuit for temperature logging via a serial port; small, fast, and acceptably accurate. special versions available for exotic requirements; high speed, low speed, additional sensors, long distance or pedantic serial bus. The program in the microcontroller knows two protocols; the one wire bus used by the DS1820 temperature sensor, and the serial protocol expected by your computer. Once power is applied, the program fetches data from the sensors and sends it to the serial port, repeatedly. The data from the DS1820 arrives in a format peculiar to the sensor. The program calculates the temperature from the data and translates it into human readable ASCII digits. No special program is required on the computer. The first line sent by the microcontroller is a reset notification, which includes the microcode version, a date and time serial number, and either a C or an F, depending on the GP3 pin at the time. The sensor data is reported in the international standard Centigrade if the GP3 pin is tied low HIGH. If it is tied high LOW, then the data is converted to Fahrenheit. A larger range and accuracy is obtained from running in Centigrade mode; users are advised to make their conversions within the attached computer. (if you have one of the special versions) to use an input pin as a simple digital input, connect it to the supply pin (pin 1) via a resistor of about 10k, and connect a switch between the pin and the ground pin (pin 8) through a resistor of about 1k. When the switch is closed a zero will be read. Avoid shorting the pin directly to the supply, as the microcontroller may attempt to pull it low during the test for a DS1820 sensor. a 10uF tantalum capacitor across the power supply pins of the DS1820 chips tends to provide more consistent measurements. To put it another way, if you remove it you may get random error in the samples. Some people will have a number of comments about my design. Please remember I'm an amateur electronics enthusiast and a professional software engineer. Why not operate the DS1820 sensors on a bus instead of per port? There is insufficient memory within the microcontroller to remember the device address for more than one or two sensors. It is simple to remember which pin is being addressed. This circuit may not work with some serial ports. One reason is that the voltage swing of the transmit data to the computer is not within specification, however the detection band for most serial ports accepts it. No protection is present for lightning damage. Adding this protection is beyond my skill. Users should disconnect the device before experiencing lightning if the cabling is of significant length. The 78L05 regulator may not be able to regulate properly if the current and voltage provided by the serial port DTR pin is insufficient. Ideally this should be a more expensive low drop regulator, or a zener diode instead. Symptoms of insufficient voltage are loss of the start of the verbose reset packet. The 1N4003 diode could be replaced with a diode having a lower voltage drop. In fact, the DTR line could be just connected to the 12V supply rail within the computer itself in order to get around most of the power problems. Why isn't there a MAX232 or other chip to change the signal levels from 0V to +15V and 5V to -15V as required by the EIA232 standard used by computer serial ports? Almost all serial ports are offset such that voltages above 4V are recognised as being logic 0, and voltages below 1V as logic 1. This allows external devices the ability to violate the standard by sending an inverted 0V/5V signal. This means the device is not suitable for long cable runs, and may not work with all serial ports. However the author has tested the device on more than 30 ports with no issues. Accepts temperature data from the circuit and periodically logs the values to a disk file. The file is named with the current year and day number, e.g. 2000070.log, and is formatted as a comma separated value (CSV) list. You are expected to use other software to analyse the data collected. Full source code is provided under the GPL license. tsl11win.zip for Microsoft Windows. Tested on Microsoft Windows 95, Microsoft Windows 98 Second Edition, Microsoft Windows 2000 SP1, and Microsoft Windows NT 4.0 SP6. Unpack the ZIP file into a directory and run TSL.EXE. 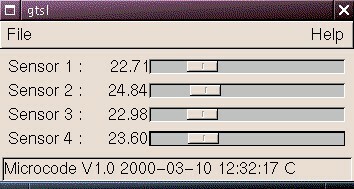 tsl11dos.zip for FreeDOS or MS-DOS. Tested on MS-DOS 4.00.950 on a 386/25 using floppy disk only, and on a machine with a hard drive. With floppy disk, do not exceed a logging rate of once every two seconds. Unpack the ZIP file onto a bootable floppy or a hard disk directory, then run TSL.EXE. If you have no hard disk partition, ignore the warning message about "c:\cwsdpmi.swp". tsl-1.2.tar.gz source code for all three versions above. Requires CYGWIN to build the Microsoft Windows version. Requires DJGPP to build the FreeDOS/MS-DOS version. Use this version on Linux; just unpack the tar.gz file and type "make". Includes a file ChangeLog that describes the changes made to each released version. http://quozl.linux.org.au/darcs/tsl/ is a Darcs repository of tsl, patches are welcome. Accepts temperature data from the circuit and displays them on four horizontal sliders. Provides an option for resetting the microcontroller by lowering DTR, and has logic to detect lack of data flow. Currently does no logging (use the program above). Full source code is provided under the GPL license. gtsl-0.1.tar.gz for Linux, tested on Red Hat Linux V6.1, with GTK+ V1.2.6. Unpack, ./configure, "make", "make install", attach the circuit to the first serial port and run gtsl. 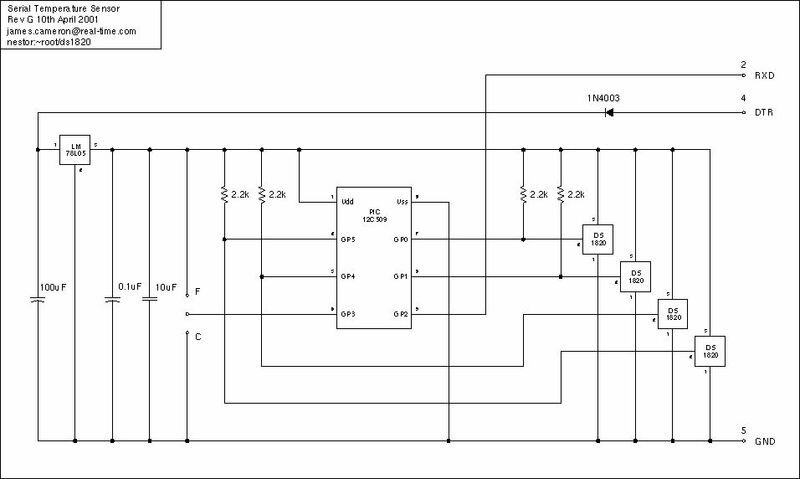 For programming your own PIC 12C509 microcontroller. Drives the DS1820 sensors, obtains temperature readings, converts them to ASCII and sends them through the serial cable. Full source code provided, under the GPL license. Code was written to assemble using gpasm-0.0.6. ds1820-gpasm.patch patch to make code assemble without error under gpasm-0.9.13. The resultant HEX file has not been tested. Asgeir Nilsen's Python tsl.py a simplified rewrite of tsl in Python. The source code for the microcontroller program was released on 1st January 2002 under the GNU General Public License. You have the right to manufacture and sell duplicates, though under the license terms you must supply the source code. The source code for the software inside the microcontroller is <a href="http://quozl.netrek.org/ts/">available from the developer</a>. Unlike most of my other work here, this project wasn't originally Open Source. It was too exotic for that. I had wanted to see if I can make anything out of this type of work. I asked people to buy the chips. Nobody bought one off me directly, but I did end up selling a few hundred to Kitsrus. My return on investment was negligible. I don't consider it worth the effort to continue the project. It doesn't work on some serial ports, what to do? Measure the voltage on the supply pins for the microcontroller or the sensor. If it is below 4.75V, then the serial port is not supplying enough current. Options are either (a) change the serial port, (b) hook DTR and another signal line together to increase the current, (c) substitute another power source for DTR, such as from a 12V plug pack, of at least 20mA capacity, (d) use a low-dropout voltage regulator instead of the 78L05. It doesn't work on the DS18B20? True. The code works well for DS1820 sensors. It works acceptably for DS18S20 sensors, with a slight degradation in reading accuracy. It doesn't work properly with the DS18B20. The reason it doesn't work is that the data is in a different format inside the sensor. The bits are used for different purposes. I do have several DS18B20, but have not found the time to work on the problem. I'd also welcome code changes made by others, under the GPL. Where is the HEX file? This isn't provided here. Either buy a preprogrammed chip from others (which I no longer make any money on), or assemble the code yourself from source. wanting to learn about microcontrollers and electronics by constructing this project, and yet being unwilling to do the whole job, is inconsistent. Got a question? If you are wanting help, or are willing to help others, please visit the project community page. 2006-07-29 Add Darcs repository and Debian package links. 2006-02-06 Remove mailing list and add Wiki. 2006-01-03 Added link to Python implementation of tsl by Asgeir Nilsen. 2003-06-10 Corrected QKits location, thanks to Dennis Wallace. 2003-06-04 Added reasons why the hex file is not available. 2003-03-11 Tabulated the availability matrix. 2003-01-18 Patrick Brochu reveals that my schematic here has C and F swapped. 2003-01-10 Release tsl-1.2.tar.gz to fix off by one day error, reported by Stephen Kitchener in May 2002. 2002-06-26 Dave Gomez spots an HTML error that suppresses most of the page for some web browsers. 2002-05-10 Add note about MPASM and TRIS instruction. 2002-01-08 Release patch for use with gpasm 0.9.13 or similar, which ignores the IF on line 1262 of ds1820.asm. 2001-12-31 Release source for program on microcontroller. 2001-07-10 Add test results for TSL.EXE on Microsoft Windows NT style operating systems, and remove request for results. Thanks to Chris Kirby and Lars Karlander. > of the box material would make the connection less reliable. The PCB was by Peter. I agree, there is no obvious method. > line marker. I believe that UNIX uses just a CR character. elsewhere; after the welcome message and after each sensor reading. receiver. The CR may have been dropped due to the error.